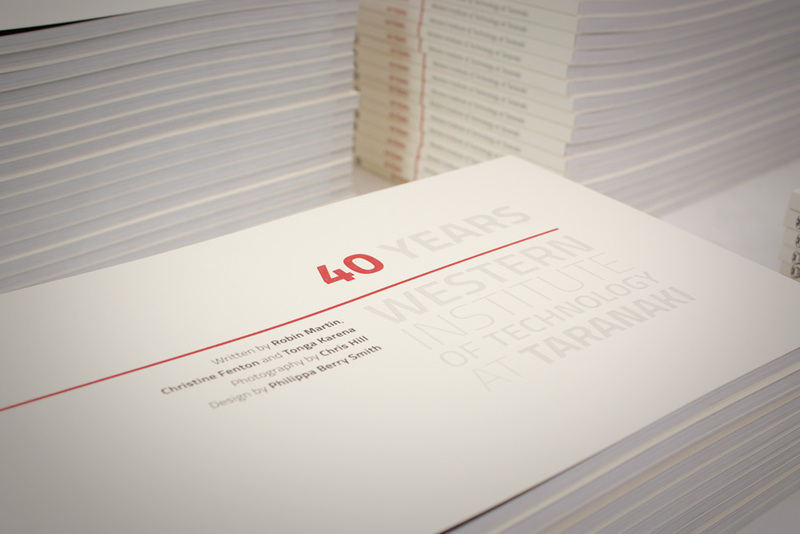 To celebrate the 40th Anniversary of the Western Institute of Technology at Taranaki (WITT), it was decided to publish a commemorative book showcasing the journeys of a range of students and the history of the institute. Together with a select group of other WITT staff comprising of writers and researchers (Robin Martin, Christine Fenton, and Tonga Karena), a photographer (Chris Hill), and marketer (Danny Hall). Philippa had the honour of creating the graphic design, layout, and print specifications for this book. 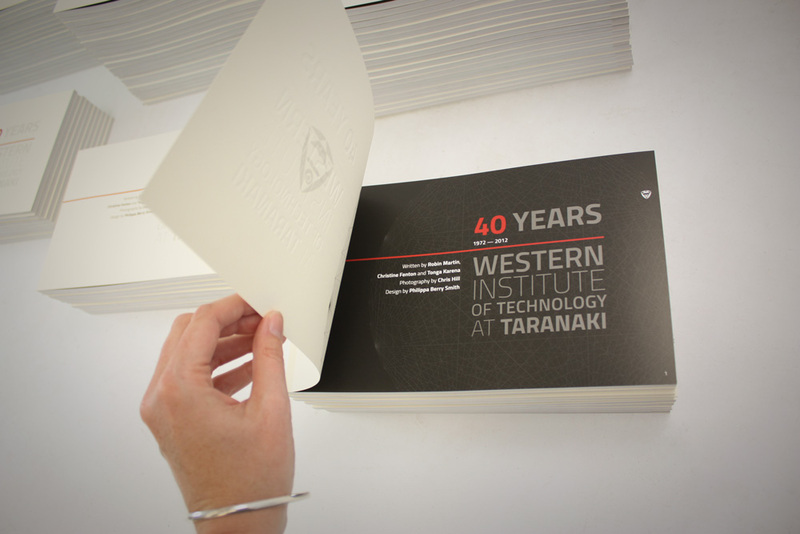 The design of the book revolves around the number 40: a deep ruby red is the highlight colour and this was chosen specifically for it’s relationship to 40th Anniversaries, and to honour the 40 years that WITT has served our local Taranaki community. A 40-sided geometric shape features inside the front and back covers. This object looks a bit like a globe, and references the world of possibilities that students undertake when they study at WITT. 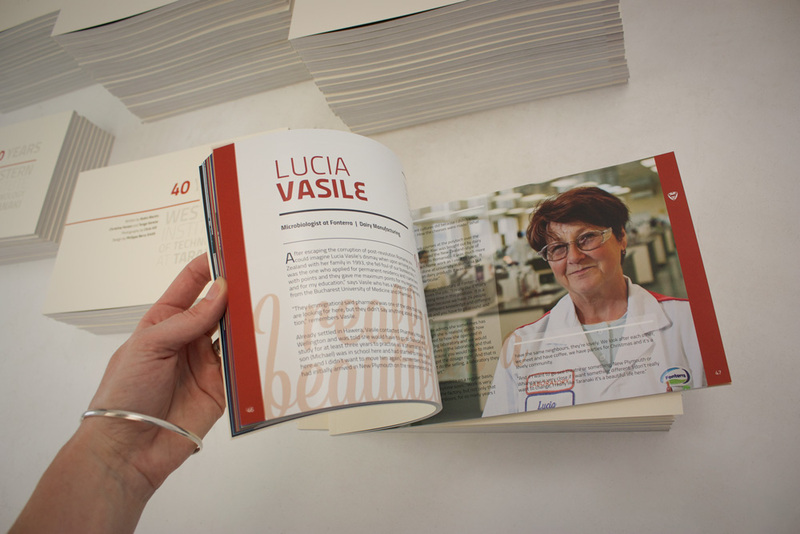 The format of the book is soft-cover to be flexible with a non-standard shape based on the golden-ratio. This shape was chosen to ensure a pleasing presentation format for all the many and varied types of information that had to be displayed within the book: photographs, photo-montages, articles, graphs, charts, and timelines. Paper choice was an important consideration, as the book had to feel special while not blowing the budget. As inspiration, Danny Hall presented another recent historical publication which featured a black cover. Flipping that idea on it’s head, Philippa investigated pale covers, but looked at ways of making the cover “unexpected” and “quiet” – in direct contrast to the visually stimulating and colourful interior. 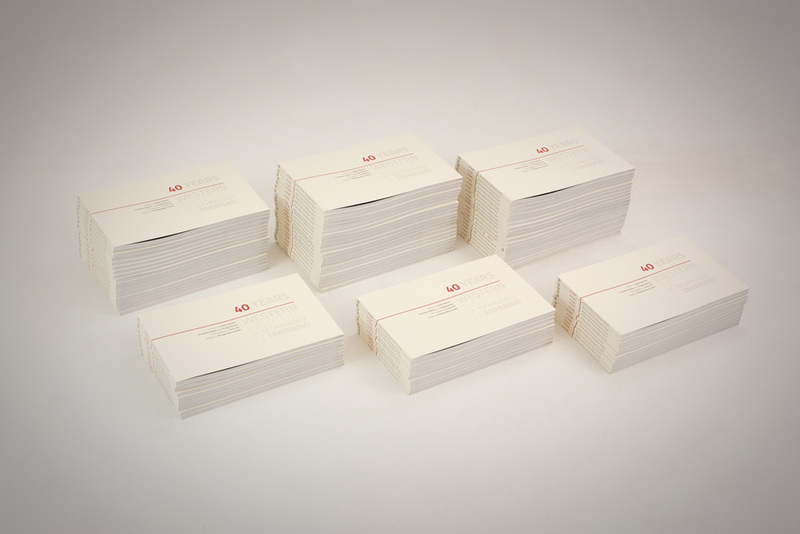 It was decided to use a textured matte cream stock – and print with a special embossing technique. A mixture of printing techniques gave the result we required, without costing the earth. A lovely additional feature of the cream cover is that with each reading, it absorbs the imprint of the reader. Over time, these books gradually change colour ever so slightly as they are pored over and read. It is a beautiful element to the design of this history book in that it literally record the history of it’s existence. Interior pages are set in a satin digital stock that reproduces the beautiful photography of Chris Hill accurately and truthfully. Opening the book is like getting a wonderful colourful surprise! Since so much of the content was story and text-based, a key point of the design brief (after making an awesome cover!) was to keep the reader engaged in the content. We wanted the book to be more than just a dull history book, it had to be interesting and the visual design and page layout held the ability to achieve this. 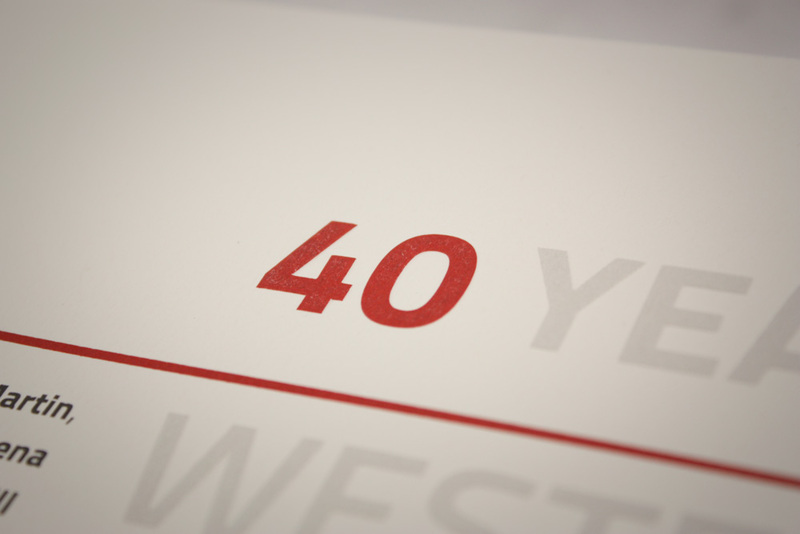 Philippa used two typefaces – one is a flowing brush script style, based on the advertisers hand-lettering of the 1970’s – the era when WITT was founded. The second typeface is much newer, published just a couple of years before this book. It has a range of font weights, and it is designed by a group of students – a nice reflection on the purpose of WITT itself. Each page is individually crafted to ensure a vibrant and fresh feeling as you browse through the pages, and since there was such variance in the word-count and imagery for each article, a set of basic graphic styles was designed to maintain a consistent appearance. As part of the design of the book, Philippa realised that some content she required simple wasn’t available. Numerous trips up into WITT’s storage attic revealed boxes of old photos and slides that required sorting, organising, naming and digitizing. This project turned into a historical photo archive job as well. And then there were the thousands of digital photos stored all across the campus that needed to be cajoled from various hard drives and servers. Several images of the campus as it currently stands were required, so Philippa took those also. This project included all the Photoshop work and digital post-processing of images. A fascinating project: to design and print a book has got to be a top achievement for any designer. Working with a talented crew of fascinating people to pull together a research publication of this scale in less than 6 months was a massive undertaking. 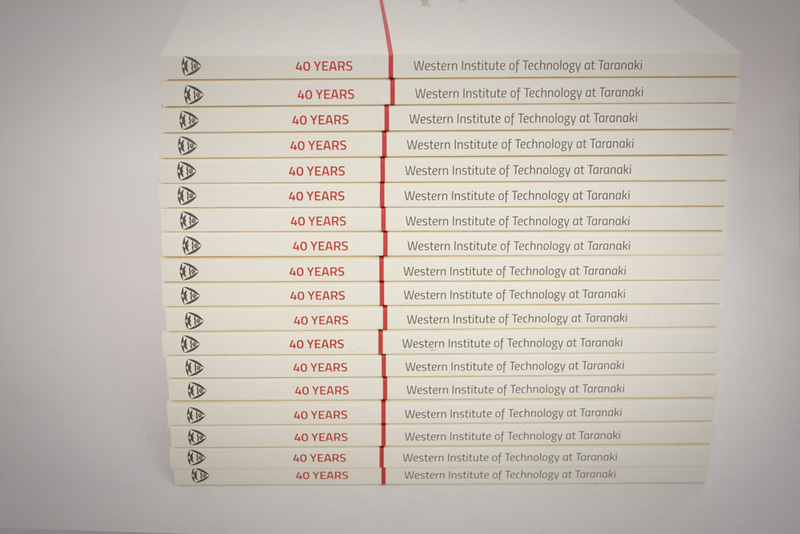 Launched at a special ceremony on campus in 2012, this book has been well received and treasured by many.